A dental crown is a cap used to cover a tooth that has a healthy root but is no longer structurally sound. If you live in the Highlands Ranch area, Highlands Ranch Family Dental can help if you suspect you need a dental crown. All-Porcelain Crowns – This type has the most natural appearance and is the most popular. Made from porcelain with a porcelain lining, it is almost indistinguishable from natural teeth. All-porcelain crowns are metal-free and durable, but capable of chipping if proper care is not taken. Dr. Lunn Prefers to provide his patients with all porcelain crowns. Gold Crowns – Gold crowns are appropriate when appearance is not a top priority and are mostly used on back teeth. They are durable and give a good chewing surface, but look starkly unlike natural teeth. Porcelain-Fused-to-Metal Crowns – Porcelain-fused-to-metal crowns are both durable and have a very natural appearance when first placed. The metal lining adds strength. However, over time, a dark line may be visible at the gum line as gums recede, revealing the lining’s edge. Each type of crown is placed basically the same way. Dr. Lunn will take an impression or mold of the affected tooth. Dr. Lunn attaches the dental crown. He will first fit it with a non-permanent cement, to ensure that it is comfortable and the right color, size, and shape. If all is right, then permanent cement is applied, the crown placed on top and a special light used to cure, or harden, the cement. If you live in the Highlands Ranch area and have cracked, decayed or otherwise damaged teeth, please call 303-346-4495 or email us today to schedule a free initial consultation to see if porcelain crowns are the right solution for you. Letting already damaged teeth go untreated can cause further destruction to the surrounding teeth and bone. 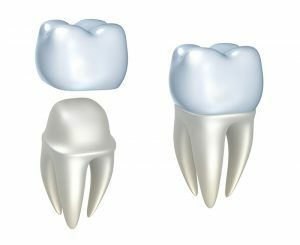 What’s The Difference Between Porcelain Crowns And Dental Bridges? If you have missing teeth, you increase the risk of further disease and decay as well as shifting teeth. Highlands Ranch dentist Dr. Lunn, can help you restore your teeth and smile with dental bridges. A dental bridge is a false tooth suspended between two other teeth via crowns. Bridges are permanent and are not removable like dentures. Traditional Fixed Bridge – Held in place with crowns on either side of the false tooth. Resin Bonded Bridge – Typically used on the front teeth. The false tooth is fused to metal bands that are bonded to the neighboring teeth with a resin. Cantilever Bridge – Used when the missing tooth has no neighboring tooth on one side. The false tooth is secured to two neighboring teeth on the other side, like a cantilevered balcony. If you live in the Highlands Ranch, Castle Pines, Castle Rock and Littleton area and have one or more missing teeth, it’s important to see a dentist right away. Call 303-346-4495 or email us today to schedule your dental visit.